Microsoft's first financial report for 2011 is out as well and the results indicate something that people in the know have been anticipating for a while. It looks like over the first three months of this year, Microsoft generated a net profit of $5.23 billion, which for the first time in history is less than what Apple ($5.99 billion) accumulated over the same period of time. Apple has already overtaken Microsoft, arguably its strongest competitor, in terms of quarterly earnings – that happened six months ago for the first time ever. Furthermore, thanks to the booming iPhone sales and the sky-high interest in the iPad, Apple's quarterly revenue reports just keep on showing record-breaking results. Until now, Cupertino was having a hard time catching up on net profits since Microsoft's products simply generate higher gains with every unit sold in comparison with Apple's. Taking a closer look at both companies' quarterly reports reveals that Microsoft still maintains its net profit margins near the 32% mark while Apple only averages about 24%. However, if Microsoft keeps on overlooking the steadily rising tablet market, as it seems to be doing so far, it would not be surprising to see Apple's lead in the net profit section grow even further. Not shocked. WinMo is dying while Apple is making money hand over fist off of the iPhone. iPad is eating into Netbook sales and to a lesser degree notebook, and all the while Apple charges a premium fee. What I don't like about Mac products is that they offer PCs with low system specifications partnered with premium prices. This shouldn't surprise anyone. If Windows was actually reliable they might have a chance. Apple makes top quality, reliable products. In my opinion, the reason I still acknowledge Microsoft at all is for the gaming industry. Gaming is still better on PC because of compatability and of course the Xbox console. If Apple were to take over the gaming industry Microsoft will be a sinking ship. They're already showing what they're capable of with iOS. What's next? A gaming console? iGame, iPlay, MacArcade? Hmm... I'd get it. I still love the xbox, but not the system freezes or red ring of death. Maybe the Microsoft powerhouse will finally start sinking some substantial resources into developing some products to please the "simple" consumer. Apple has been taking advantage of them since the day they opened their doors so now its time to see Microsoft actually step into the ring as opposed to just booing from the stands. Yeah I know .... deago may not have meant it, but that does seem a tad condescending, don't it? Who cares. APPLE: FAIL GOOGLE: WINNING!!!!!!!!!!!! How can you say so? Yes they may have beaten Microsoft in terms of profits and all these money stuffs. But does that mean that Apple also beat Microsoft in terms of performance and useability? Plus Microsoft is only selling Operating Systems. Their profit comes from their OS alone. Unlike Apple whose profits came from a lot of things such as iPhone, iPad and Macbooks. umm.. Xbox, MS Office, Windows phone 7, silverlight, directX,... on n on n on n on the biggest difference is MS is a multi national multi armed mega corperation that has its hands in thousands of things. Not things it does all are profitable. Apple is a much smaller company that is focused on osX,iOS,iTunes, and iPods, and their accessories. They dont actually manufacture a single thing themselves and always price everything way above its actual worth to have "percieved quality". ya honestly microsoft has a crapload of stuff... that is such an invalid argument... and yes... they have beaten microsoft in terms of performance and useability... have they beat it in marketshare? no. The think it's change and Apple has the best quality products. 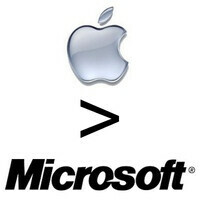 Apple vs Ms is like BMW vs Toyota MS is the work horse, cheap and used by the masses. More people use it, more parts, repair shops, 3rd party add-ons etc. Apple is the BMW, more expensive smoother ride but limited and more costly repair. Less after market parts, higher insurance etc. Apple has done wonders with marketing 75%, creating the "brand", they really have also done a great job designing a device that works consistently for the average consumer 25%. Kind of on oxymoron cause you would expect more confort features in a premium brand. Apple makes it work though. It's like Lexus vs honda Accord this days lots of people prefer Lexus over the Accord cause the lexus has the powerful engine and one of the most fantasy car ever with lowest petrol Consumption.